File photo dated 12-06-2010 of England's Gareth Widdop. PRESS ASSOCIATION Photo. Issue date: Tuesday February 17, 2015. 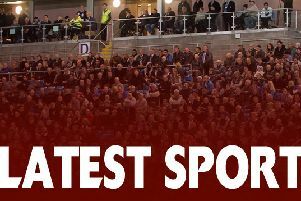 English fans will get a chance to see the real Gareth Widdop when he runs out for St George Illawarra in the opening match of the new World Club Series in Warrington on Friday night. See PA story RUGBYL Column. Photo credit should read Anna Gowthorpe/PA Wire. Haifax-born Gareth Widdop will be fit for England’s Test series against New Zealand and expects his St George Illawarra team-mate Mike Cooper to join him in the squad. Widdop defied a thigh injury to play for the Dragons in their elimination play-off tie against Canterbury Bulldogs at the weekend, although he could not prevent them going down to an extra-time sudden-death 11-10 defeat. The stand-off, who has started the last four matches for England in the number six shirt, now has six weeks to recover from the injury before the opening autumn international against France at Leigh on October 24. England coach Steve McNamara spoke with Widdop after Saturday’s game and told Press Association Sport the player will be “fine” for the forthcoming internationals. Widdop, who missed his first match of the season the week before, spoke to www.dragons.com.au of his determination to defy the thigh injury in a bid to help his club through the play-offs. The former Melbourne player is now setting his sights on facing the Kiwis in a three-match series starting on November 1 and says prop forward Cooper, who joined the Sydney club from Warrington two years ago, deserves to be called up alongside him. Cooper was included in McNamara’s squad for last year’s Four Nations Series Down Under but did not get to make his Test debut. McNamara, who will name his squad on October 11 - the day after the Super League Grand Final, says he is not concerned that South Sydney prop George Burgess will go into the opening Test against New Zealand without having played for two months. Souths’ elimination from the play-offs means that Burgess will have to complete a two-match suspension, imposed for throwing a water bottle at an opponent, when England play France.